- There are two types of scary movies, says acclaimed horror film director John Carpenter. - Those that have an external scare factor like a monster, a psychopath, vampire or alien from outer space, and those who have an internal scare factor where there is a killer on the loose who might or might not be in close relation to a main character in peril. But maybe there is a third type as well? Where what frightens the viewer is not what appears on screen, but the destructive thoughts the images provoke in your own mind. 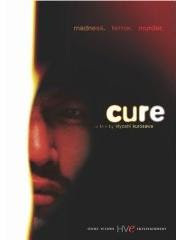 Little known Japanese cult classic Cure surely seems to suggest so. It is a movie about subtleties. It is a movie about concentration. But most of all, it is a movie about you. A string of murders occur all over Japan. At first they appear to be totally unrelated, but they have something in common: All victims were killed by someone who loved them dearly, and in all cases the murderers are found sitting next to the body of their loved ones, without any other explanation to their sudden violent behavior than it simply felt right. This is not a normal serial killer movie. Something has provoked all these people to kill the most important people in their lives, and as the puzzle starts slowly to unravel, you suddenly find yourself wondering if you could ever do the same. Are you always in control of your own actions? And do you dare watch the whole film to find out?